Kate and Don interview Teoti Anderson from A Dog’s Best Friend in Fort Lauderdale, Florida. Teoti is a dog trainer, an internationally recognized speaker and author of seven books on dog training, including her latest; The Dog Behavior Problem Solver: Step-by-Step Positive Training Techniques to Correct More Than 20 Problem Behaviors. 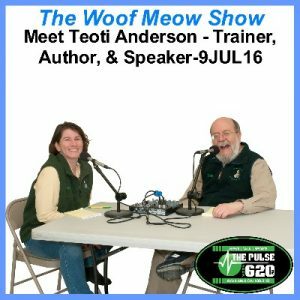 Teoti shares how she got interested in dog training and started her career as a pet care professional. We discuss her book, asking her to address the top three problem behaviors she sees with her clients. We round out our interview with Teoti asking how she would advise a first-time puppy parent and a student interested in a career as a pet care professional. In this podcast from June 18th, Kate and Don discuss a variety of pet tips directly related to summer and the increasing temperature. They start off the show discussing how the heat and sun can adversely affect our pets. Then they switch to water safety, followed by talking about how to deal with bug bites, stings, parasites, and seasonal allergies like those caused by tree and grass pollens. Then they move to chemicals like lawn fertilizers, herbicides, pesticides, fungicides, insecticides, rodenticides and all sorts of other “…cides” that are routinely used in our environment to kill something we do not like. Next, they discuss the pros and cons of traveling and vacationing with pets including steps you can take to make the experience more fun than exasperating. Finally, they talk about the gatherings of people that occur in the summer and how that may negatively affect your pet.